IsatPhone Pro offers clear voice telephony, globally. It comes with a variety of data capabilities, including SMS, GPS, and data service support up to 20 kbps. IsatPhone Pro is an Inmarsat designed and manufactured satellite phone, offering clear voice telephony, globally. It also comes with a variety of data capabilities, including SMS, short message emailing and GPS look-up-and-send, as well as supporting a data service of up to 20kbps. It’s one of the most robust handsets in the market and purpose-built for the most reliable, and award winning, Inmarsat-4 network – the most sophisticated satellite communications network in the world. The IsatPhone Pro delivers the clear voice quality that you’d expect from the market leader. This phone is designed to work in just about any conditions and there are no worries about battery life because it has the longest in the market. Where is the IMEI number found on the IsatPhone Pro? The IMEI number is displayed under Menu > Settings > About. Where is the firmware version found on the IsatPhone Pro? The firmware version is displayed under Menu > Settings > About. Where is the IMSI (SIM card number) found on the IsatPhone Pro? The IMSI number is displayed under Menu > Settings > About. Can a GPS fix be obtained manually? If the phone continues to show the GPS fix required icon (which means that a new GPS fix is needed) select Menu > GPS position. The new GPS fix is displayed. When this screen is open, the phone will attempt to refresh the GPS fix every 30 seconds. How does the IsatPhone Pro obtain a GPS fix? Before a call can be made, the phone needs a GPS fix so it can be located by the satellite. This happens automatically, but if a new GPS fix is needed the GPS fix icon will be displayed on the screen. The phone should be kept in the open with a clear view of the sky until the icon on the screen disappears. Once this is done the phone is now ready to register with the network. How does the IsatPhone Pro connect to the Inmarsat network? Stand outside with a clear view of the sky with the phone antenna pointing upwards. There must be a clear line of sight between the phone’s antenna and the satellite. The more sky you can see the stronger the signal should be from the satellite. If open sky makes up about 70% of your view when you look up, then the signal should be strong. ‘Searching satellite’ will appear on the screen. The top left of the screen will display ‘Inmarsat’ when your phone is connected to the satellite. The signal bars indicate the signal strength. At least two signal bars are required to make and receive calls. How is the IsatPhone Pro switched on and off? Hold down the red key, which is found on the top right of the main keypad, until the screen lights up. The first time you use your phone, use the navigation keys to select your language and set the time zone. To switch off, hold down the red key until the screen shuts down. How is the SIM card inserted into the IsatPhone Pro? Remove the battery cover by using a coin to turn the screw slot on the back of the IsatPhone Pro until it is vertical. If the battery is in place, lift it out. Slide the catch down on the SIM holder and flip it outwards. Make sure the angled corner of your SIM card is on your left and slide it into the holder. Flip the holder back into place and slide the catch back up. Insert the battery, replace the cover and turn the screw slot until it is horizontal. What features does the IsatPhone Pro have? What coverage is available for the IsatPhone Pro? The IsatPhone Pro operates around the world. Global coverage maps are available from the Inmarsat.com webiste. How long are Inmarsat SMS messages kept, if undelivered to mobile phones? SMS messages are sent instantly. If they are not delivered this could be due to an issue with the recipient’s network. Customers will need to check the time that mobile phone operators keep SMS messages in their system. How long are SMS messages kept in the system if undelivered to Inmarsat numbers? SMS messages are kept in the system for a maximum of 7 days. How long are messages retained when an email is sent to the SMS service? Inmarsat will keep email messages sent to the SMS service for up to 72 hours. How long are voicemail messages kept in the BGAN voicemail system? Voicemail messages are kept for 72 hours in the voicemail system. Does the IsatPhone Pro Data service support Bluetooth profiles? Headset and hands-free profiles (only for speech, not for data) are supported. Is there a WAP browser for the IsatPhone Pro Data service? There is no web browser on the handset interface. Low speed data is not working on the IsatPhone Pro? Check is to ensure that the low speed data service is provisioned on the SIM card. For IsatPhone Pro data, are USB drivers required to connect the handset to a PC? Is a dial-up connection required for the IsatPhone Pro data service? Yes, if using X-Gate, but no if using Amos Connect. What should be done if the handset interface freezes during an IsatPhone Pro data sessions? Ensure that the latest firmware is installed on the handset. Is the IsatPhone Pro data service compatible with Mac OS or Linux? No, it is not compatible (as at April 2011). Can the IsatPhone Pro be used at sea? 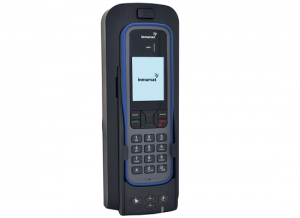 IsatPhone Pro is part of Inmarsat’s land portfolio and can be successfully used on land. It is designed to be used at sea with a maritime dock and antenna. When maritime environmental conditions are calm, users may have success using it hand-held, but is not designed for such use at sea. To gain the best performance at sea, use IsatPhone Pro in conjunction with a maritime docking station with a maritime antenna. These can be purchased from Beam Communications. What is provisioned for emergency calling outside the USA for the IsatPhone Pro? Emergency calling is not supported on the IsatPhone Pro outside the USA. What is the format to send an email to the IsatPhone Pro? The format to send an email to the IsatPhone Pro is: 870776xxxx@message.inmarsat.com. This is covered in the User Guide supplied with the handset. What is the total weight of the IsatPhone Pro complete with box and accessories? The total weight including handset, battery, box and accessories is 948g (2.09lb). How does the IsatPhone Pro indicate a network connection? In the top left hand corner of the screen “Inmarsat” will be displayed beneath “IsatPhone”, and four beeps will be heard when the phone is connected to the network. Is there a Chinese keypad version of the IsatPhone Pro? PINYIN input of simplified Chinese is available. This is achieved by phonetically entering the ‘sound’ of characters and requires the user to select from a list of relevant character synchronization entry is achieved through Latin character input. Why is the IsatPhone Pro battery not charging? How can contacts be synchronised using the IsatPhone Pro? Does the IsatPhone Pro support Fixed Number Dialling? The Isat Phone Pro supports Fixed Number Dialling. This allows the administrator of the phone to lock outgoing calls to specific numbers or prefixes. The Fixed Number Dialling feature is switched on and off from the Security menu and requires the PIN2 code (9999 by default). The user then goes to “Contacts”, where the “FND” section allows numbers to be typed in or copied from the phonebook. With Fixed Number Dialling switched on, these are the only numbers that can be dialled. The other phone numbers stored on the phone remain available for browsing but not calling. The User Guide for the IsatPhone Pro provides a more in-depth description of this process. How long does it take to get a GPS fix for a new IsatPhone Pro phone? What is the IsatPhone Pro battery life? IsatPhone Pro battery life is 8 hours talktime and up to 100 hours standby time. If a user experiences a reduced battery life then the firmware version should be checked to ensure that the latest version is installed. How is the keypad locked on the IsatPhone Pro? You can lock the keypad by pressing the mains key in the centre of the phone followed by the * key. Only the green and red buttons will be active now. How is the IsatPhone Pro’s battery charged? Plug the charger into the power source. Then connect the mini USB connector from the plug into the base of the phone. Leave to charge until battery is full (it’s important to fully charge when first purchased). How is the voicemail feature accessed on the IsatPhone Pro? To retrieve and listen to voicemails, press and hold down the 1 key, or dial 57. This will then automatically dial your voicemail inbox. Alternatively you can dial the voicemail box directly on +870 772 001 899 and press the green key to dial. How is an incoming call declined before it is answered on the IsatPhone Pro? When there is a incoming call and the phone is ringing you can press the red button to decline it. The details of the calling party will now be stored in the call register, under missed calls. How is the redial feature used on the IsatPhone Pro? If you press the green button you can see a list of the previous numbers which you have dialled. Cycle through the numbers with the cursor keys, and l press the green button again when you reach the one you want to call. How is an outgoing call made on the IsatPhone Pro? To make a call enter the full international number by dialling +, then the country code, area code (without the leading 0), telephone number and then press the green key, eg. +44 1621 123 456. How is an ongoing call terminated on the IsatPhone Pro? Press the red button to end/terminate a call. How is an incoming call answered on the IsatPhone Pro? Firstly the antenna has to be deployed. When the phone rings, press the green button to answer the incoming call.